Mistakes Parents Should Not Do While Talking to Kids - Babymommytime - Top Blogs on Baby Care, Parenting Tips & Advice. Check out 10 worst mistakes parents make while talking to their Kids under the age of 10 years old. Kids are sensitive and easy to mold, therefore parents can easily handle their emotions & frustration. Shouting or Scolding will not make the work easy for kids; it will complicate the matter more. This is the worst thing parents do with their kids ‘comparison’. Comparison is the word which every child or human being refused to accept. Whenever you compare your kid with other kids, you are demoralizing your Child’s confidence. You have to give more importance to your kids as compare to other kids. At every step of his or her life keep motivating them. The comparison will spark the angrier at them, which will be uncontrollably for you in the long run. Parents should always try to motivate their kids to take up things which they like or love to do. The comparison will make the weaker. Have you ever thought how many times you use or say a word ‘NO’ to your child. Kids start using the Word ‘NO’ when they are babies or toddlers and they first person they learned from is YOU. The word no itself sounds no negative that its impact on kids is same. Just make it sure that you use the word ‘No’ only when it’s required the most. Otherwise, your kid will start taking it as default. Always talk to your kids with positive energy and use the words which have a positive response and impact on your kid’s brain. Listening is an art which every parent should learn. You must have read or heard that a good listener is always a better person. Your kids want you to understand what they are saying to you and also sometimes things which they don’t say but they mean. Take 15 minutes in the evening to hear what your kid wants to share with you. Show him that his opinion matters to you and you admire that too. This will create a strong bridge between you and him. Don’t take out your office or work, frustrated with your kids. Arguing with them will not help you to get what you want them to do. You and your kid may have a different opinion or viewpoint on different things, which does not mean that you force them to hear you. Don’t show that you are elder so you have the right & power to argue or yell at them. Always be calm and let your child say what he wants to say first. Then slowly explain them what is right or good for them. Kids are intelligent enough to understand your views. Many parents have the habit of saying or repeating the same work for multiply times. It’s very irritating for everyone, especially for kids. They don’t have passion to listen to you and this will make them frustrated. In case you have given them some work or you want them to do something, then wait for a while so they complete their work. Repeating the words will not help him to do what you want them to do. Have passions and use another method to control your child behaviour. Give them the opportunity to do the work by them self, they will take time but it’s ok. Discipline is good, but that does not mean that you will start yelling at the kids in front of anybody. Scolding your child in front of other people is the worst thing that parents too. There are many ways to control your child or tell them what to do or not. But scolding is differently not good for you and for your kid’s relationship. Kids are in the habit of doing naughty things in front of other people. They take advantage of doing all wrong things, but as parents we know how to control our child behaviour. Don’t scold them in front of guests, which take them in another room and talk to them. Or distract their mind by offering other things. One of the best ways is to involve them with some house work like serving food or playing some games. Few parents make this mistake of fighting in front of the kids. Parents should not blame each other for their kid’s bad behaviour. It’s not that one parent is responsible for the kid’s bad behaviour; it’s both who are responsible for it. Sometime what happened that your kid has done something wrong and as a father you start blaming her mother for it? Shouting and fighting will not solve your problem; it will further increase the tension situation. If you disagree on something related to your kid’s behavior, please don’t fight or start arguing in front of them. 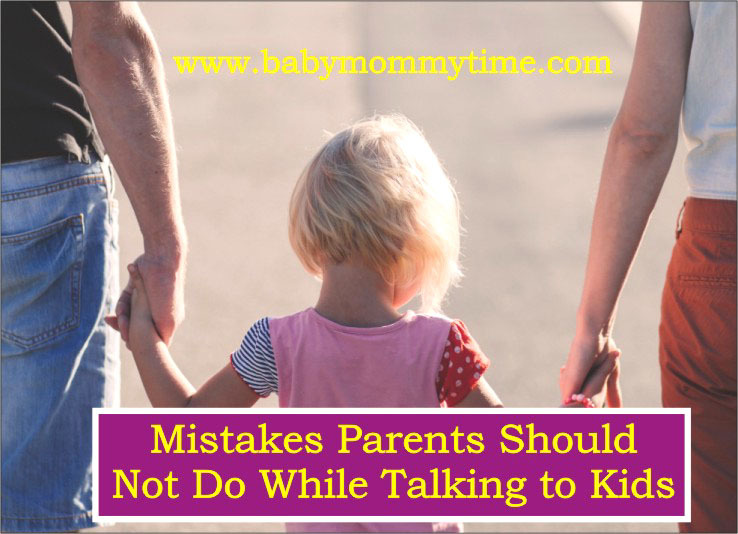 Just talk you each other in a private room and make it sure that you don’t discuss about it in front of your kid. Every parent goes through this phase of over protecting their child. Nothing is wrong in this, but gives the space to your kid to learn from their mistakes. It will make them more confident and strong-minded. These days child safety has become a major issue, but it does not mean that we as a parent stop the fresh air for our kids. Protect your child when it’s required, let them make their own mistakes it will help them to become a good person. Also, they will learn to fight or stand for their rights. To make your kid perfect in very thing, we start imposing our views on them from the very beginning. We all want our kids to be brilliant in everything like academics, sports & competitions. But is it far with our kids, to impose on their small shoulder all this. Why he says to do through so many competitions in life just to satisfy your EGO. Let them have free breath and enjoy life, guys, it’s their life and they have right to live the way they want. Parents are there to guide them not to force them. Provide them the ladder and guide or support them. They will climb the ladder by their own and reach the heights the way they want. Parents who have two kids are in the bad habit of comparing their kids with each other. It’s not necessary that both your kids have to be brilliant in studies or sports. Every child has its own qualities and capability, let them explore it by themselves. The sibling comparison will make them rivals in some point of time in their life. Therefore, please stop comparing them or giving examples of each other. Every child has something unique quality, its parent job to identify that and provide full support. Just remember that they are brothers or Sisters, they should love each other and support each other in the journey of life. Give equal love to both your kids and respect their spaces.